Eat a take-out meal, buy a pair of shoes, or read a newspaper, and you’re soon faced with a bewildering amount of garbage. The United States is the planet’s number-one producer of trash. Each American throws out 4.5 pounds daily. But garbage is also a global problem; the Pacific Ocean is today six times more abundant with plastic waste than zooplankton. How did we end up with this much rubbish, and where does it all go? 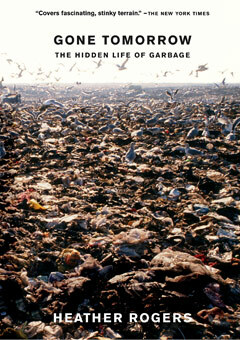 Journalist and filmmaker Heather Rogers answers these questions by taking readers on a grisly, oddly fascinating tour through the underworld of garbage. Said to “read like a thriller” (Library Journal), Gone Tomorrow excavates the history of rubbish handling from the 1800s to the present, pinpointing the roots of today’s waste-addicted society. With a “lively authorial voice” (New York Press), Rogers draws connections between modern industrial production, consumer culture, and our throwaway lifestyle. She also investigates controversial topics like the politics of recycling and the export of trash to poor countries, while offering a potent argument for change.